Click on photos to enlarge. (A poppy means no photo available at the moment.) For further information, follow the blue hyperlinks. Many lead to external links over which this site has no control. "Their Name Liveth For Evermore..."
but who are the real people behind those names? 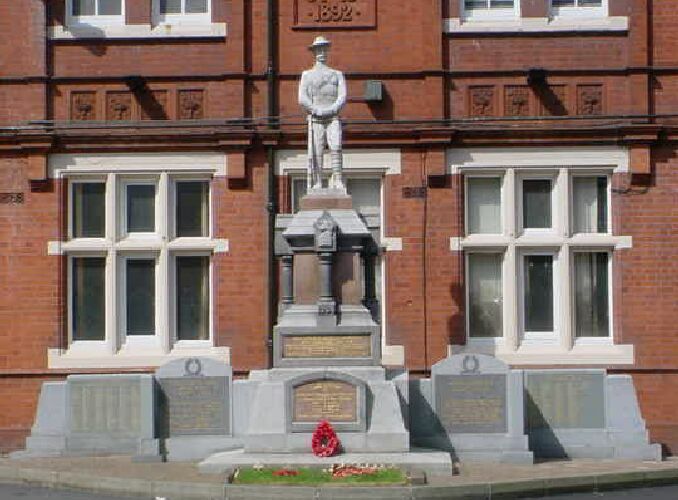 The Newton-le-Willows and Earlestown War Memorial stands outside the Town Hall in Earlestown, Merseyside. It was originally erected in remembrance of the men killed during the South African War of 1899-1902, the Boer War. It is a soldier of this period which stands on the memorial. To the right is a plaque bearing the names of soldiers, sailors and airmen who died during the Second World War. It is hoped that these names can be researched in the future. To the left, two plaques are dedicated to the "Men of Newton-le-Willows who as soldiers died in the Great War of 1914-1918", though some of those named were seamen or members of the Royal Flying Corps. Nevertheless, there is a list of three hundred and fifty four names. Who are the real people behind these names? Using information from several sources, including "Soldiers Died In The Great War", the Commonwealth War Graves Commission's website, British Army WWI Service Records, 1914-1920 (known as the "burnt records" after an air raid in 1940), regimental histories and war diaries, the Official History of the Great War and, especially, obituaries from the local papers, the "Newton and Earlestown Guardian" and “Warrington Guardian”, it has been possible to identify most of these men, and write profiles of some of them. It is hope that in time most will have profiles on this site. Photographs will be used when this is possible. For the time being, those men with full profiles are indicated by an asterix. Any comments, feedback, reports of dead links, infringment of copyright and, especially, any further information will be gratefully received at nlwmemorial@hotmail.com.